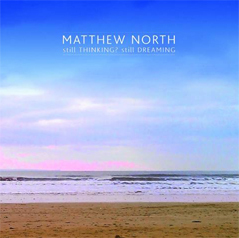 Matthew North is a South West based musician, producer, photographer and sometimes radio broadcaster. 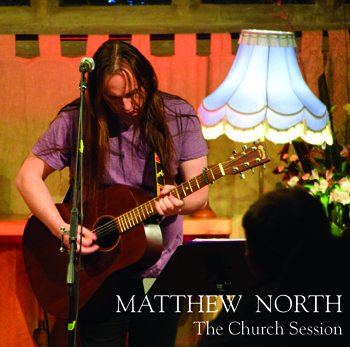 His music has been played on BBC 6Music, BBC Television and has been featured and interviewed on BBC Radio 4. 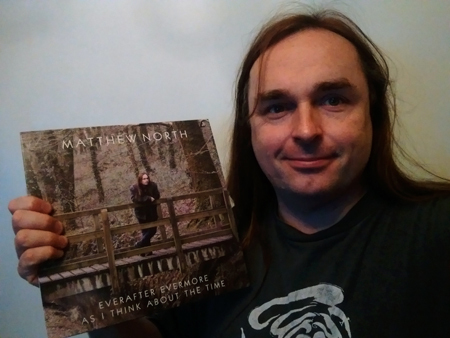 As well as being a solo artist Matthew is the founder member of the bands All Living Fear & Secrets For Septemberand is also guitarist with Jazz legend Mike Westbrook and has a close involvement with The Crazy World Of Arthur Brown. 2019 is looking like another busy year for me, so far 4 Westbrook shows in the diary and more recording on the way. All Living Fear are planning more dates and I am working (slowly) on new material. There is also a very special Box set album I am working on, more on this soon. Well the tour with Mike Westbrook in Italy was a massive success full houses and great music what more could you ask for? And I am very excited to announce that we will be performing at Ronnie Scotts on the 12th February 2019. In addition will be performing Kate Westbrooks GRANITE in Germany in April. Started work with Mike Westbrook for out tour of Italy and Sicily really enjoying some new material (to me) to perform in the set. 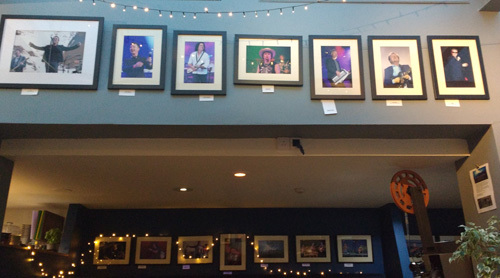 Also my Photographic exhibition has been extended for a few more weeks. 25th July at 7pm I launch my first ever photographic exhibition 'No Pass Required'. After the launch the exhibition will run for 6 weeks. It will take place at the Exeter Picturehouse Cinema. And you can view it for free. I also have a few more solo gigs happening over the summer. Big news for November I am off to Italy with the Westbrook band. Been a busy few weeks, booking more shows see gigs page for more. Had a great time playing in London and tomorrow (21st June) I perform with Kate and Mike Westbrook at the premier of Granite the new album. This has had some publicity including a feature on BBC South West TV programme 'Spotlight'. Happy new year. Working on new music and booking live shows for 2018. Already 2 booked for Easter including a support once again to Nick Harper and a return to the Tavistick Wharf. I had a great time at the Chagstock festival and even made it on to TV you can see it right here on BBC Spotlight. More shows being added all the time keep an eye on the gigs page. All Living Fear reunion has been going very well and there are some video clips on youtube. 'still THINKING? still DREAMING' is officially released on the 21st those of you that pre ordered now have the CD and I'm happy to say I have had some good reports from people that have listened. Also I went to see U2 last week without doubt one of the best if not the best concert I have ever been to. Some photos on my Facebook page. Also more All Living Fear and more Mike Westbrook shows on the way. 'still THINKING? still DREAMING' has just gone off to Lee Fletcher for mastering and the CD has an official release date of 21st July 2017. I have set up a pre sale on my bandcamp page here and as soon as the CDs arrive back from the pressing plant we will send them out ahead of release. On the live front I will once again be supporting Michael Chapman on the 4th June in Bovey Tracey but before that I am off to Suffok to play at the Eight Bells in Hadleigh on the 18th May. See gigs page for more info. I am over the moon to announce that I will be performing at this years Chagstock music festival. This will be my first festival appearence as a solo artist, hopefully by then a revised edition of my debut album will be released on factory pressed CD. In addition a Plymouth All Living Fear reunion show is now conformed and a Mike Westbrook Bigger Show concert in London is confirmed for September. All Living Fear my old band has reformed for a few shows in 2017. It is the bands 25th year so myself and Andy Racher decided to do a few gigs. The first one will be at Unit 23 in Totnes on the 24th June. We are currently booking more shows, and I am also booking solo gigs for this year. Contact me if you would like to book either or! I have also added a section to this website about my recent Photography. What could be the ideal gift for Chritsmas? My new live EP naturally! Recorded at 2 different shows it included 1 brand new song and 3 others you may know. Had a brilliant show in Kingskerswell with Nick Harper on Friday night and I have posted a track to my brand new YouTube channel. To see it click Here and please subscribe to the channel. Currently working on a new version of my debut solo album with a new mix, new artwork and a couple song changes. This will be a factory pressed CD and will be on sale soon with a new solo ep to follow. Pathfinder are currently in rehearsal and are very much looking forward to gigs and festivals in 2017. I have a solo show at Kingskerswell Parish Church in November supporting the great musician Nick Harper really looking forward to this. 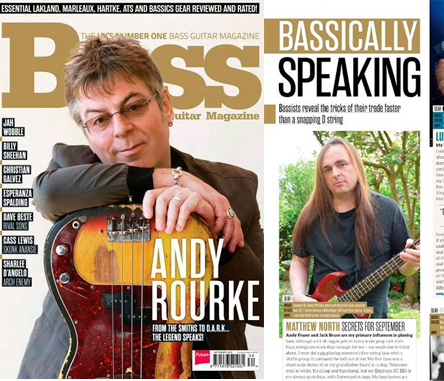 I appear in the new edition of Bass Guitar magazine. It's a little feature based around the recent Secrets For September Album. 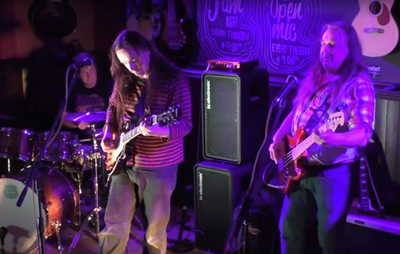 Here is a Clip from the recent Pathfinder show in Exeter. 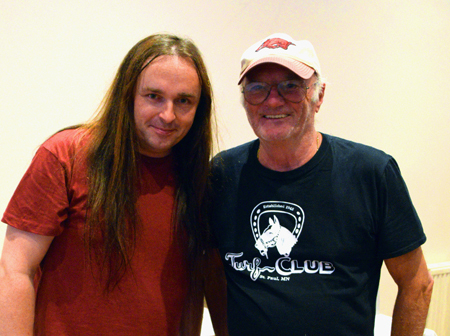 The recent solo show with Michael Chapman was a great success we may gig together again in the future. Bovey Homecoming - Yes I am going to be playing my first solo show in my hometown of Bovey Tracey on the 10th July supporting the legendary Michael Chapman. Been a busy time recently, the Secrets For September album is finished, manufactured and the pledge campaign worked very well. Hopefully we will have some live shows to announce at some point. Next Week the first of the 2016 season of shows with Mike Westbrook really looking forward to these. Recently with the other people in Pathfinder we went into a studio and put down the guys of 2 new songs as a start for an album and we hope these songs will be in the Pathfinder live set before too long. I have also started getting back into video production having recently upgraded to HD and I have a new Vimeo channel that will showcase my new work. 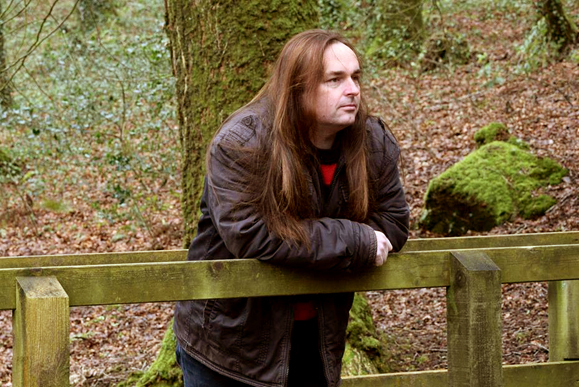 So far I have done a new video for the Exeter indie band National Pastime. See it on Vimeo. The Secrets For September album crowdfunder is well on its way now, the album is to be called 'Insert Title Ear' and you can get it right here. The second bit of news is that I will be talking a band for the first time to do a show in London performing my own songs I have give the band the name 'Matthew North's Pathfinder' looking forward to seeing some of you there at The Islington on the 24th January. Earlier this month I performed some solo material with a band for the first time with Matt Bacon on Drums and Richard Maydon on Bass. It was great fun and I hope to take the 'Matthew North Group' out live a lot more in the near future. I recently celebrated my birthday in style seeing David Gilmour, Jerry Lee-Lewis along with much other merriment. 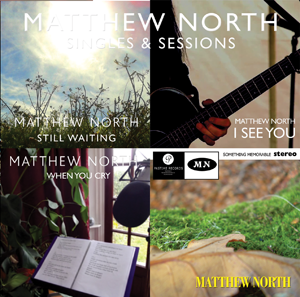 Anyhow I have released a brand new CD of all the tracks that have been only available as downloads entitled 'Singles & Sessions' it has 8 tracks running to appx 40 minutes, it also features a new take of 'Something Memorable' order it now from the shop. Having a great time touring with Mike Westbrook the album 'A Bigger Show' will be released in October. Lots of shows still to come. 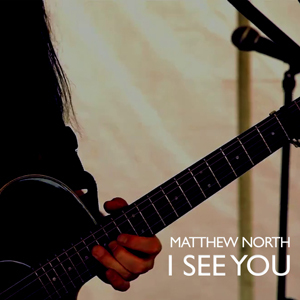 New single 'I See You' Out now a totally different version from the album. 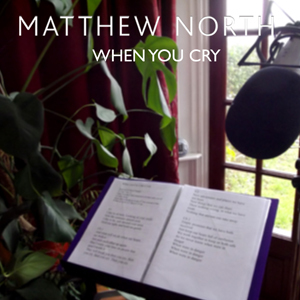 'When You Cry' Is released today April 22nd. Very excited to say that my new single will be released on the 22nd April this will be on iTunes, Amazon mp3, HMV Digital, Spotify and all other good digital outlets. There will also be a high definition audio version on my bandcamp page. Tickets for the launch gig at the Plough in Torrington that I am doing with Scott Morrison can be bought from here Plough Website. In addition to this in May there will be a new single from Secrets For September. I am booking summer solo shows and have a few festivals to look forward to inc opening for Martin Barre and The Blockheads at the PL13 Festival in Cornwall. More shows have been added for the tour with Mike Westbrook see my gigs page for more information. I have also recently updated my biography and influences on this site. 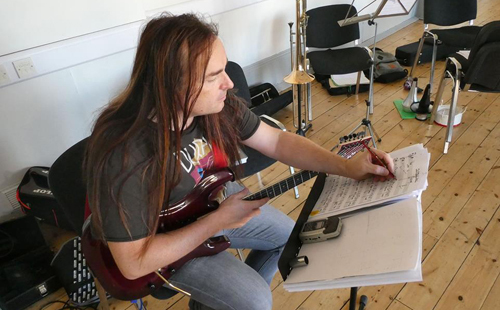 Work on the Secrets For September album is progressing and one track was recently played on Soundart Radio. On the 14th Feb I played my third Valentine show, this I have decided is to be the last on the theme but like the others it was recorded and released within 24 hours of performance, on this occasion it was online 6 hours after the doors to the venue opened!! While I am still doing some solo shows and the odd bits here and there with Secrets and Westbrook I am looking for more live projects, I recently have played as guitarist to a couple single songwriters and very much enjoyed the experience and I'm always open to performing with other artists either as acoustic or electric guitarist as well as playing bass that I have been doing a lot more of recently. With the start of the new year things are starting to get busy. I have several solo shows booked inc the annual Department Factory Valentine show this year taking place at the Phoenix in Exeter. Recently released is the album 'The Famous Weiss' by classical lute player David Miller. I mastered the album for producer David Jaggs whom I have been good friends with for over 25 years. The Mike Westbrook 'A Bigger Show' will be touring this year inc shows in Exeter, Bristol & Barnstaple with more in the pipeline. I am also working on some archive All Living Fear releases as well as working on new solo material and the new Secrets For September album. I have started recording a solo album of acoustic songs, mostly songs that I have been performing in my solo set. I have a number of acoustic shows this year and I am planning a small tour of the south east in June dates are being added as we speak. German electronic band Lakobeil are due to release via Echozone records a best of compilation album that will incudes the single Drowning Lullaby that I recorded with them in 2012. 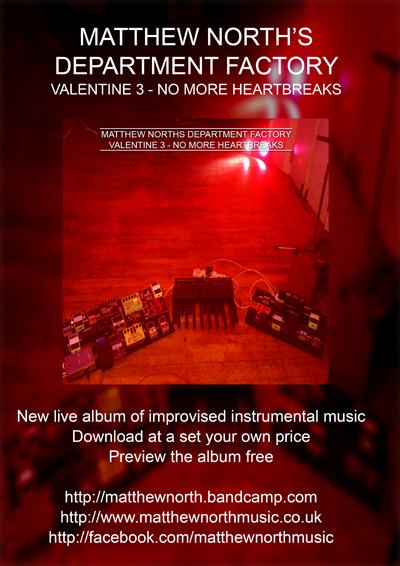 On the 13th February I performed an instrumental piece at the Exeter Picturehouse called Valentine Two and within 24 hours it was mixed and released you can listen to it and download it via my music page. 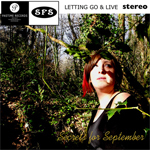 A new Secrets For September release called 'Letting Go' has just been released as a single via iTunes and Amazon plus a CD version with 28 minutes of live material. I am also planning some kind of solo album for next year and work is on going with the Westbrook video work just finished editing the recent 'Rossini Reloaded' show. I'm my Solo work, it took a bit of a back seat but out of the blue I did something new I re started an old idea called 'Department Factory' and on the 14th Feb I did a solo show looping a variety of analogue instruments. I recorded this show and with some additional material from the afternoons session at home released the album 'Valentine'. You can listen to it and download it for free, or you cam contribute something to it via my Bandcamp page. New All Living Fear album - Coming Home is out on the 1st November this is the first album where I have taken vocal duties and the first with live drums. more info can be found on Facebook. The Whitby show was great fun, maybe another show is on the horizon. Secrets For September are making a new EP 'Life And Other Stories' and have recently toured with Arthur Brown and opened for It Bites, next show is in March supporting Lene Lovich.. The Mike Westbrook Orchestra, I have started work on filming and editing some shows of one if British Jazz's finest The Mike Westbrook Orchestra whom have made countless classic albums such as Metropolis, Citadel Room 315, Love Songs, On Dukes Birthday and many more. There is a clip on my YouTube page. Can it really be that long since I updated this page wow. Well a lot has happened in brief, Secrets for September has gone from strength to strength, we welcomed new singer and friend Ellie Taylor into the band, and we made our debut on a live BBC Radio session before opening for The Magic Band at the Exeter Phoenix, since then we have done around 20 shows inc several festivals such as Kozfest, Plymouth Freedom Fields Festival, Ohmfest and others and we have a good bunch of shows for the rest of the year. We also got to No2 in the Amazon Hot new releases in rock with our single 'Reflections' and tracks from our new cd 'The Festival EP' have been played on many radio stations. As for other musical projects All Living Fear are to play the Whitby Goth Weekend festival in November this is the bands only show planned for this year to celebrate the bands existence for the last 20 years. This will be a special gig first one with a drummer and a completely different set to the last time we played. There will also be a new All Living Fear CD out for the show. I'm also doing a few more singer / songwriter gigs and recently have had Mike from Secrets join me on Djembe and we have had a really great sound. What an unbelievable year 2011 has been, I have achieved so many goals that I never envisages that I would ever do. The last couple Secrets shows have been by far our best, and we have more good things to come. Al being well our album will be released around February and we will spend the summer playing gigs and festivals. Also recently All Living Fear released a single the first with drums for nearly 20 years and has met with great acclaim from various movers and shakers so much so we will be performing in mainland Europe for the first time towards the end of 2012. Also I'm still on the Radio every week at around 11pm on BBC radio Devon / Cornwall and you can also listen online. Wow where does the time go, well most of my time has gone on Secrets for September, we have started playing live and enjoying the experience and we have 75% of our album recorded and hope to have it released by the end of the year. I have also been working in the background on some demos for new All Living Fear material and we have also re recorded some songs for free download that you can get here still strange to think that All Living Fear will be 20 years old next year. I have updated the gigs page with all that is coming up. Lots of things have been going on the last few months, my new band 'Secrets for September' are about to release their first single as a band on June 10th via iTunes and Amazon MP3 the song is titled 'Upside Down'. Recently at one of my acoustic shows at the Picturehouse I was honoured to perform with my good friend Arthur Brown, we did 2 songs Devils Grip and That's how strong my love is, you can see a video of devils grip on YouTube. I am not doing as many acoustic shows at the moment as Secrets For September is getting more and more busy, but I hope to get some new songs online by the end of the year. I have also been slowly working on with All Living Fear on some new material but this is in preparation for the bands 20th anniversary next year. Recently 2 download only eps were released include my debut acoustic ep 'Broken Strings' and a new All Living Fear ep 'Broken dream' both eps have had the thumbs up from Mick Mercer you can see the review here.